If you're like me, then you love music. So while I won't listen to full on music on my evening runs (when I'm not experiencing a little sciatica problem, of course), I do love a good audio book. And if it's got some music to flavor it up? Even better. But, who the heck am I? I'm just a reader who experienced The Scorpio Races in audio format, and I was completely blown away, not just by the story, but by the music. And dontcha know, but the author is not only a writer, she's a musician as well and did all of the music for The Scorpio Races. We're talking beautiful melodies that are perfectly suited for the Celtic landscape of the story. This is one of the main reasons why I love the audio book world. I love that full experience. After I listened to The Scorpio Races, and read a few more of her posts on her blog, it's pretty obvious she cares about how her work will be experienced by a reader/listener. Fully engaged in the entire creative process, down to participating in the selection of the narrators, her audio books and book trailers get the full treatment. In The Scorpio Races, she contributed all of the music for those magical in-between moments. It was incredible. It's frustrating at times when listening to an audio book and it just seems like a publisher threw it on the assembly line of "get-the-audio-out-of-the-way" and doesn't care about the narrator, the music, etc. Not so in the Maggie Stiefvater case. I have to read more of her works (I mean, listen). Click here to view the YouTube video of her playing a haunting melody that was used in the Shiver book trailer. 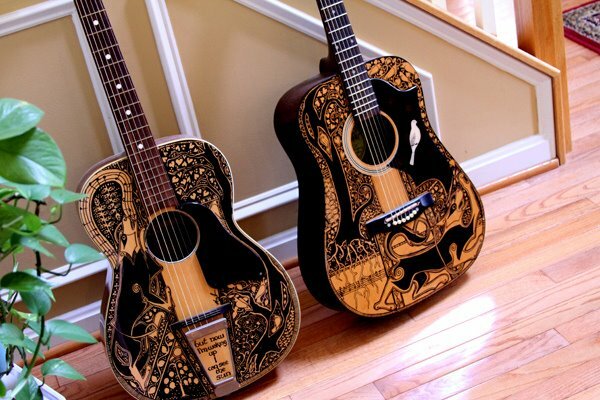 Then last night on her Facebook page, she shared that she would be doing a giveaway for her upcoming new release The Raven Boys, that will be similar to a prior giveaway when she took a Sharpie and drew such unique and wicked cool designs on these guitars. She's an accomplished illustrator and artist, too. I. Am. Floored. Click here to go to the author's Facebook page. I tweeted asking the author if I can use this, but I haven't gotten a response just yet. I will remove it if she wants me to! Anyway, a long way of saying that I plan to read much more from this author and should probably add all of her audio books to my TBR. So I ask you: What's your favorite Maggie Stiefvater book? And did you listen to the audio? I'm a huge fan of Maggie's and I've never read any of her books! She is one talented woman!! I haven't read The Scorpio Races yet, but I thought the Mercy Falls series was really good on audio. I'll have to try this one too. I agree, not all audio productions are good. The difference in the way some of them are presented is striking. I haven't read anything by Maggie Stiefvater yet but as an audio fanatic, this sounds like a book I'd enjoy. I have The Scorpio Races on audio, and have not gotten the chance to listen to it yet, but you make me want to load it onto my ipad and start it right away! I need to find another audio to wow me, and I am pretty sure this one is going to be it. And by the way, I think her artwork and music is AMAZING! I read the book but now you have me intrigued about the audiobook and the music!!! I received a free ARC of The Raven Boys and was kinda meh about it, solely based on the cover (yeah, I know, don't judge a book by its cover, blah blah blah). After reading your recommendation, I may have to give it a chance! Thanks! I am a total fangurl! Can't wait till The Raven Boys comes out! Wow, awesome post! I've never tried an audiobook before so I think this book would be a great place to start. That's amazing that Maggie did the music herself too, you can really tell she cares. I listened to the audiobook of Shiver and simply hated the narrators. They sounded nothing like the age the characters were supposed to be and that gave me some major ick factor. It may have biased my opinion of the book, but I think it had way too much romance for my taste, and not enough of the paranormal. I already have Scorpio Races in print, and am hoping for a much better experience with it. A. I love Maggie's work but haven't read it all or listened to any yet. B. Sounds like I must must must get TSR on audio. C. I need to try Raven Boys. D. What a gorgeous guitar.